Summer is finaly here. Now is the time to think about what you are going to do with your little ones once school is out. British Soccer Camps are the most popular soccer camp in the US. With an innovative curriculum that develops skills, speed and confidence in players ages 3-18, The British Soccer Camp provide boys and girls with the rare opportunity to receive high-level soccer coaching from a team of international expert's right in the heart of their own community. My son has been playing soccer since he was 7 years old. He is now a 14 year old 8th grader who still has a love for the sport. He was recently chosen selected one of the top team members for his middle school soccer team. If I were to be totally honest. I would have to say the British Soccer camp has played a big part in him being able to make the soccer team, year after year. If you are serious about your child building self confidence as well as skills, I would highly recommend enrolling your child in the British Soccer Camp in your local area. In addition to teaching new skills and improving game performance, each British Soccer Camp provides lessons in character development, cultural education and is the most fun your child can have learning the sport they love! British Soccer Camps are the most popular soccer camp in the US. With an innovative curriculum that develops skills, speed and confidence in players ages 3-18, The British Soccer Camp provide boys and girls with the rare opportunity to receive high-level soccer coaching from a team of international expert's right in the heart of their own community. In addition to teaching new skills and improving game performance, each British Soccer Camp provides lessons in character development, cultural education and is the most fun your child can have learning the sport they love! 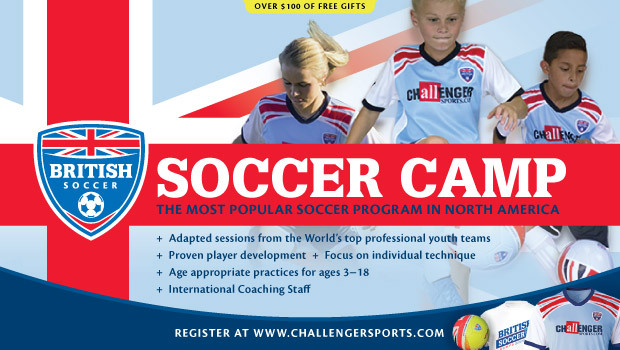 Enroll you child in a British Soccer Camp today REGISTER FOR CAMP & GET FREE SOCCER JERSEY, SOCCER BALL, T-SHIRT & POSTER with code: CAMP17 .https://www.challengersports.com/british-soccer/.